Stepping into the festive season with an organic Chocolate and Wine retreat! With the holidays just around the corner, what better way to ease into the festive season than with a relaxed, yet exciting, yoga retreat… with a twist! Simmi Fink, owner and yoga teacher at Hohm Yoga & Wellness Sanctuary, will be hosting her annual year-end retreat to facilitate body-mind-and senses into balance. We got in touch with Simmi to hear all about what you can expect on her retreat. As you make your way through a tropical jungle on the wooden walkways of Mantis & Moon Backpacker's Lodge, in the heart of Umzumbe KwaZulu-Natal, you will find hOHM Sanctuary nestled between banana & papaya trees. Greeted by a giant Ganesha, you will feel the enchantment as you step through the ancient indian doors. The serene and positive energy welcomes you with open arms. “You feel like you have lost your way in time” says Simmi, explaining that the backpackers is a truly magical place. Simmi Fink has been offering regular yoga classes and retreats ay Mantis & Moon Backpackers Lodge since 2014. “It was just amazing” says Simmi, explaining that the energy she experienced after hosting her first retreat was electric. The experience of watching people transform from the first to last day was what inspired her to host more treats. Simmi has since hosted 20 retreats at hOHM Sanctuary, becoming more passionate about sharing the practice of yoga during each one. The hOHM Yoga Sanctuary studio is based on Simmi's most focused part of her practice; Breathing/ Pranayama. She believes that by using just the breath alone, you can heal your body & your mind. This beautiful studio shares a 360 degree view allowing you to truly connect with nature. “A retreat is the perfect opportunity for people to unwind and connect with themselves.” says Simmi, going on to explain that a longer immersion into yoga can often allow you to go deeper than what you would experience in a regular yoga class. With more time to focus on yoga practice, mantra, chanting, soul searching, long relaxations - you are given the opportunity to go a bit further, not only physically but also in other forms. "Breathing, Meditation & Relaxation is something not honoured in our daily lives, but by lighting our light & giving permission for others to do the same, we all can inspire, grow & be that change we wish to see!" Simmi is excited to be hosting her annual year-end Organic Chocolate and Wine Yoga Retreat. This weekend retreat provides you with the perfect opportunity to unwind and restore as 2018 draws to a close. There will be a strong focus on clearing energy and letting go. Those who attend this retreat can expect to experience how yoga & other healing therapies can benefit you in all aspects of your life, by bringing your body-mind-and senses into balance. There is no doubt that you will leave Mantis with a deep understanding of yourself and feeling ready to start your own regular yoga practice. 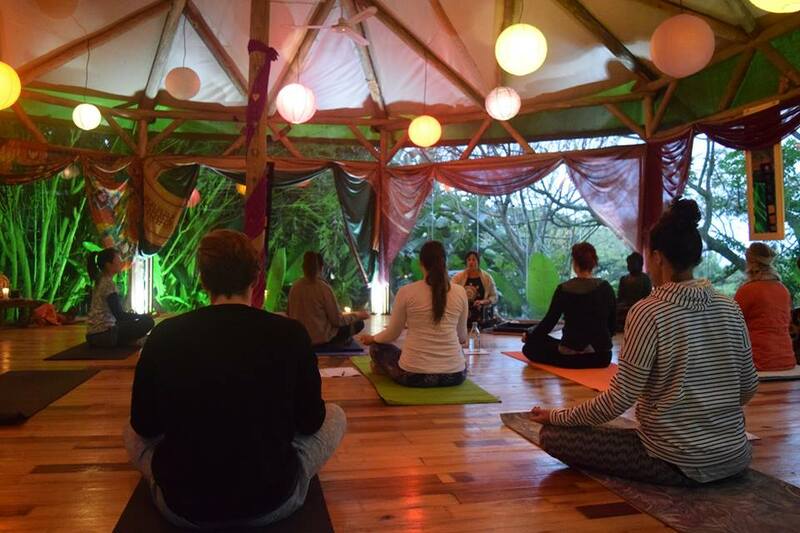 Although Simmi’s regular retreats are non-alcoholic and usually based on chakra yoga and healing, she looks forward to this retreat as a change to be more relaxed. A favourite amongst practitioners, this retreat allows you to enjoy a natural and tranquil environment while enjoying delicious organic and vegan chocolate treats and wine in the evenings. You can expect to learn strategies through healthy living and food workshops that will help you to remain healthy over the festive season. Along with delicious and conscious meals, guests can look forward to ocean and snorkeling experiences, mud cleanses, meditation walks along the sacred river, fire ceremony as well as plenty of time for relaxation. There will also be a variety of classes including aerial and chakra yoga as well as a strong focus on pranayama to raise vibration and clear energy blockages. One of the highlights of this retreat is the opportunity to be serenaded by the sweet vocals of hOHM’s resident yoga teacher, Natalie Baxter and her talented drumming partner. This serene live music will be incorporated into movement classes, creating a safe and nurturing atmosphere. When asked what else she was looking to, Simmi answered; “The sharing circle at the end is my favourite”. Each person that attends these retreats always learns something new about themselves. The uplifting and positive energy leaves you feeling on top of the world. “Everyone is healing their own battles” says Simmi, going on to explain that these retreats are the perfect environment to list and share in a safe space. With a new and improved yoga studio comes a new energy, Simmi is looking forward to hosting many more retreats.